Each month Digital Signage Connection asks their members of the DSE Advisory Board a question of the month. 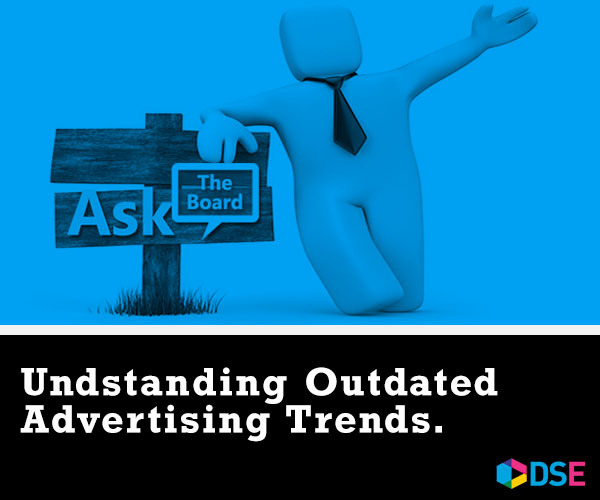 This month, the question focuses on outdated digital signage advertising trends. Here is a response from ClockNine’s Chief Creative Officer, Travis Kragh. What digital signage advertising trends do you see as being outdated and why? Advertising design trends will always come and go, but one element of digital signage that could be on its way out the door (or at least inline for a major reduction in usage) is “image based content”. While it is inexpensive and easy to produce it’s no secret that video and motion have been steadily spreading into our lives. From the content we digest, to websites and apps we interact with, it’s clear there is a certain expectation to see something dynamic when we come face to face with a screen. Now I am not saying that every element in your ad should be moving, but what I am saying people are beginning to expect motion. To better understand the evolution of motion, just take a closer look at your phone and how it has evolved over the past 5 years. Social media apps have shifted to feature video content. Facebook now allows video profile pictures. Twitter added video feeds to stay alive while Instagram and Snapchat continue to be video heavy with content. CNN, ESPN and almost all major news apps now have some sort of video feed. Even the photos taken with the iPhone have evolved away from the still image. With Live Photo, a photograph becomes a short 3-second clip. All that said, people are becoming to expect motion in the content that they engage with. This demand will only increase as younger generations and other technologies advance. Image based content will never fully disappear, but the static ad is beginning to lose its luster.